1. 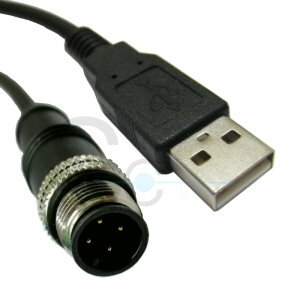 Cable: 28AWG*1P+24AWG*2C+ADB OD:4.5MM BLACK PVC JACKET UL2725. 2. USB CONNECTOR: USB A MALE WHITE INSULATOR SOLDOR TYPE. 3. SENSOR CONNECTOR: M12 4P A-CODE MALE BLACK INSULATOR SOLDER TYPE. 4. ALL CONNECTORS OVERMOLD BLACK PVC. (b)INSULATOR RRESISTANCE: 20 Mohm MIN, DC300V 0.01sec. 7. RoHS and REACH Compliant.